Zola is a software technology company focused on books. We support both discovery (through Recommendations) and transactions (through The Everywhere Store™). That sounds simple enough – but the platform we built to support those businesses is actually quite large. It needs to be, to make any book available on any website in any format. Among other things, we ingest, on a daily basis, metadata and files for the millions of existing (and new, and newly released) ebooks, audiobooks and print titles from all the publishers in the US. We “concord” all that data with our concordance engine, “build” ebooks that are encrypted by DRM (or not, depending on your preference – and yes we make .mobi and .epub formats for you tech dorks that are wondering), and enable their sale through The Everywhere Store™ – which, yes, can be white labeled, along with our iOS and Android reading apps (which, btw, also support audio files. Yes, audio and ebooks in the same app.) That also means, of course, securely supporting credit card transactions, embedding recommendations, capturing email addresses, providing analytics, heat maps, and other services to help you sell your books. We’ll talk more about all our technology services in coming posts. For now it’s enough just to see all the parts on a single page. We’re always working on improving The Everywhere Store. Last week we made the widget faster – about 30% faster. Nice going, developers! We’ve also been asked recently by several clients to make it possible for them to sell signed print copies of their books and handle fulfillment themselves. So now, in addition to making it possible for anyone to sell any book in any format, we can handle the sale of autographed print books as well, enabling writers to sell autographed editions, or rare editions, or sometimes something even more special…. …Like the book Chandler Burr has created. Chandler has been writing about perfume for years – as the first ever Scent Critic for the New York Times, author of The Emperor of Scent, and perhaps most importantly, as the curator of the groundbreaking show “The Art of Scent 1889-2012,” which debuted at the Museum of Arts and Design in New York City. Chandler personally designed and commissioned an extraordinary catalogue, which is more than a book: it includes vials of a dozen of the world’s greatest scents. He is using The Everywhere Store to sell signed collector’s editions of the catalog directly. Chandler’s book is particularly special, but as with every feature of The Everywhere Store, anyone can use it to sell any book anywhere, and we’re looking forward to seeing other authors sell signed copies of their print books and more in the near future! We’ve talked about the pressing need for diversity in the world of book retail, and we’ve talked about our new technology that enables anyone anywhere to sell any book from their website. 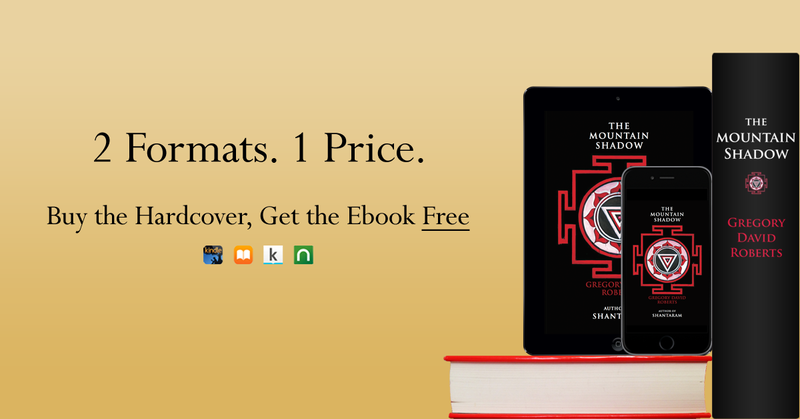 Now we’re very pleased to announce the public launch of the Everywhere Store technology with a bestselling book by an acclaimed author: The Mountain Shadow by Gregory David Roberts. So – how much more money do you make with The Everywhere Store? We’ll talk about the Special Case next week. For now, let’s focus on self and traditionally published. Let’s say you’re traditionally published by a Big Five publisher (e.g., Random House) and your ebook is priced at $9.99. For every ebook you sell through other retailers, the retailer takes 30% of the $9.99, leaving your publisher a “net” of $6.99. The publisher then passes on (in almost all cases) 25% of that $6.99 to you the author. Do the math: 25% of $6.99 is $1.75. So you typically get about $1.75 for every ebook you sell. What happens when you sell with The Everywhere Store? Well, of course using The Everywhere Store doesn’t change your relationship with your publisher. What changes with The Everywhere Store is your cut of the retail portion. Instead of giving up 30% off the top, you – the author – get half of the retailer’s cut. That’s in addition to what your publisher pays you. The Everywhere Store is an ebook retailer just like Amazon or Barnes & Noble or Google or Kobo. We have all the ebooks from all the publishers, so we are a retailer, just like them – but the difference is that we split the retailer’s net with you. Let’s do the math: the retailer’s 30% of $9.99 is $2.99. We split that retail portion with you 50-50, after credit card fees. So if we round the credit card fee to $0.50 per $9.99 title, that leaves $2.50 for us to split. That’s $1.25 for you. So with The Everywhere Store you get to add $1.25 per ebook sale to the $1.75 you get from your publisher. That’s over 70% more cash in your pocket per ebook. Instead of $1.75 , you’re making $3.00 per sale. That kind of cabbage adds up. But wait, what if you are self-published? That’s even better. We split it 80-20. Let’s do the math again. Let’s say you are self-publishing your ebook. You price it at $9.99 on The Everywhere Store. Round the credit card fee to $0.50 again, and that leaves $9.50 to split. Do the math: 80% of $9.50 is $7.60. The relevant comparison point is what you’d earn on, say, Kindle Direct Publishing, which maxes out at 70% of $9.99, or $6.99 per sale. With the Everywhere Store, self-published writers can make another $0.60 per sale, which is another 8.6% in your pocket per ebook sold. These percentages apply to any price over $0.99 – so you can sell your title for $0.99 or $1.49 or $9.99 or $13.99 or $25.99 or any other price over 99 cents and walk away with 80% of the retail price (after credit card fees) in your wallet.